This healthy chipotle hummus is seasoned with smoky chipotle pepper and just the right amount of lemon and garlic to make this addictive dip your new favorite snack! Not to toot my own horn, but… I’m totally going to toot my horn. This is hands-down the best hummus I’ve ever had. Roasted red pepper hummus has always been my go-to but this? 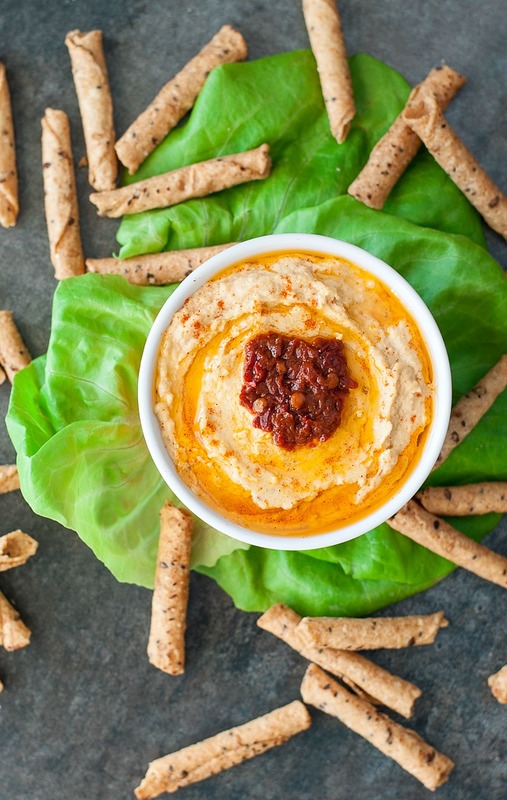 This zesty chipotle hummus is a total game changer! I’m glad my recent chipotle obsession migrated from my bean dip makeover into a big bowl of chickpeas because this is a new staple around here. It makes a fantastically flavorful sandwich spread and is great on veggies and pita chips galore! Grab a handy dandy jar of chipotle peppers and join me! You know you want to! 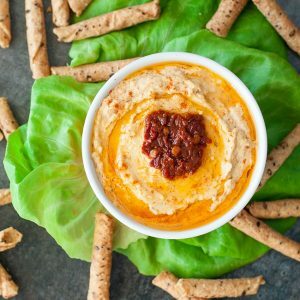 This healthy chipotle hummus is spiked with smoky chipotle pepper and just the right amount of lemon and garlic to make this addictive dip your new favorite snack! In a food processor or blender, combine chickpeas, chipotle pepper, tahini, adobo sauce. Scrape down the sides and add your garlic, salt, and lemon juice. Dive in with a pita chip for a taste-test and add more of your favorite ingredients if desired [more oil or tahini will thin out the hummus, more chipotle pepper will add heat and smoky flavor and more lemon juice will add some zest to the dip] - the above measurements were my idea of hummus perfection! Love it so! To fancily, top with half of a chopped chipotle pepper, a hearty drizzle of your favorite olive oil [I broke out the harissa-infused evoo for mine! Yum!] and a sprinkling of paprika. Serve it with... pita chips, fresh pita wedges, and fresh veggies for dunking. This chipotle hummus also makes a tasty sandwich spread! If you get a chance to try this smoky chipotle hummus recipe, let me know! You can leave me a comment here (LOVE checking those daily!) or tag @PEASandCRAYONS on Instagram so I can happy dance over your creations. I can’t wait to see what you whip up! This hummus was so flipping good! I could legit eat this hummus daily. 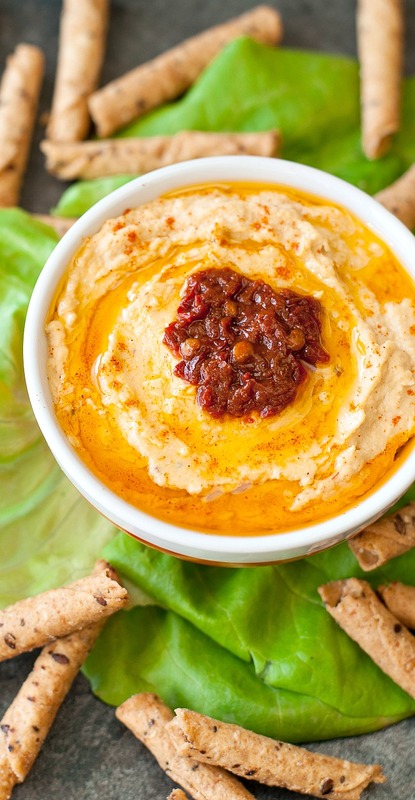 The smoky chipotle peppers and adobo sauce give this creamy, dreamy hummus just the kick it needs to be addictively delicious. The hummus (or yummus as we call it here!) will keep for a few days in your fridge, but you’ll be too busy licking the bowl clean to worry about leftovers! Next time I’m for sure doubling the batch! Or maybe I should triple it? Quadruple? All hummus; all. the. time. Greek Quinoa Bowls <– READER FAVORITE! Jenn this sounds wonderful – the perfect addition to my hummus collection! I usually buy the chipotle hummus from trader joes, but now I can just make it ) Thanks for sharing, pinning! Can I just say I love your backdrop is pieces of lettuce. You’re awesome and I’m adding chickpeas and adobo peppers to my grocery list. yesssssss! I can’t wait for you to try this one! SO GOOD! This looks SO good. The perfect hummus for my husband and I at least- totally up our alley. Would it be inappropriate to face plant right into this?! Yes! Chipotle peppers in everything! Wow this looks so good! I love the idea of adding chipotle! Def trying this ASAP! I have never made my own hummus, but after reading this recipe I think I am brave enough to tackle it! I seriously wish I could reach through the computer screen and try it right now! Jenn, this looks amazing!! I love hummus but haven’t yet explored other ways to make it, besides a classic one with garlic. Just pinned this! Thanks Rebecca! And yes! Target to the rescue! I love anything spicy! Are those tortilla chips in your pic? They look like mini corn tortillas rolled up. They are! I found them at Target – they’re Archer Farms [their store brand] crunchy tortilla rolls or something like that. LOVE them!